One of the most influential names in personality theories surrounding Myers-Briggs® types is David Keirsey. His book Please Understand Me II was one of the first I read when I decided to study personality theory because it was so widely recommended. The more I studied Myers-Briggs types, though, the less comfortable I felt with Keirsey’s version and the more questions I had. Was his insistence on grouping the 16 types into 4 categories really all that useful? Is the practice of giving each type nicknames doing more harm than good? Why did he seem to ignore Jungian psychological functions? I started to think maybe he’s not the best resource for studying Myers-Briggs, though he does offer an interesting perspective on how the 16 types might relate to historic 4 type systems. I’ve debated quite a bit whether or not to actually write this post. But I’ve been reading Personality Type: An Owner’s Manual by Lenore Thomson, who is a former managing editor of the Junginan journal Quadrant and who has taught courses on psychological types at the C.G. Jung Foundation in New York City. In her discussion of the ITP and IFP types, she voiced some of the same frustrations with Keirsey that I’ve felt, particularly in regard to how he talks about the SP types. If you’d like to get a copy of Thomson’s book, click here . Please note that this is an affiliate link, which means that, at no additional cost to you, I will receive a commission if you click on the link and make a purchase. I do want to start out by saying that I know Keirsey’s intentions were good in how he described SP types. He saw himself as “championing” the SPs (who he called “Artisans”) more than any other type because his parents, brothers, and many of his friends were Artisans. In addition, much of his work for 30 years as a family therapist was spent working with Artisan children who gave their parents and schools a hard time when they were noisy and restless or didn’t finish assignments. Lamentations is a depressing little book, at least on first glance. It’s composed of 5 poems of mourning that were once part of the book of Jeremiah, but were then isolated so they’d be easier to read in public. Traditionally, the Jewish people read Lamentations each year on Tish B’av, a fast day commemorating the destructions of the temple in 586 BC and 70 AD. The first poem speaks of sorrow, weeping, misery, and desolation that has come upon Israel. Jeremiah describes the Lord as righteous for bringing such punishment to those who rebelled. The second poem is about the Lord fighting against Israel as an enemy. As a result, there is weeping, misery, and no comfort. The fourth poem recounts more horrors that happened because of Israel’s sin. It talks about persecutions and punishment brought on them by the anger of the Lord. The fifth poem cries out to God to remember His people, recounting the punishments they’ve already suffered for their iniquities. It ends by talking about God forgetting and rejecting Israel, begging Him not to do so forever. We now know that God answered this last prayer. He didn’t forget His people or cast them off forever. In fact, God the Father sent God the Son to die in our place and redeem us. The Word became flesh and brought about reconciliation between God and man as our Passover sacrifice. One of the things I’ve discovered in learning how to better handle my anxiety is that breathing helps. I was kind of hoping when I started counseling I’d learn about a semi-magical secret trick to avoiding panic attacks and working through anxiety. And what did I find? Deep breathing. Turns out that it’s important to breath when you’re panicking. Who knew? Different people who struggle with anxiety find different ways of managing it (EFT tapping, grounding techniques, deep breathing, etc). For me, grounding and breathing seem to work best, which I find interesting since I’ve been doing both for years through my yoga practice. I just needed to start using those tools more effectively in the rest of my life, not just for 15-45 minutes every morning. Side note: I know some of my readers will think it odd that a Christian practices yoga, so here’s a link to my post where I talk about Yoga, Meditation, and Christianity. The short version is that the asana (poses and movements) and pranayama (breath control) aspects of yoga are mind-body tools I’ve been using for about 8 years now and from which I’ve seen nothing but good fruits. 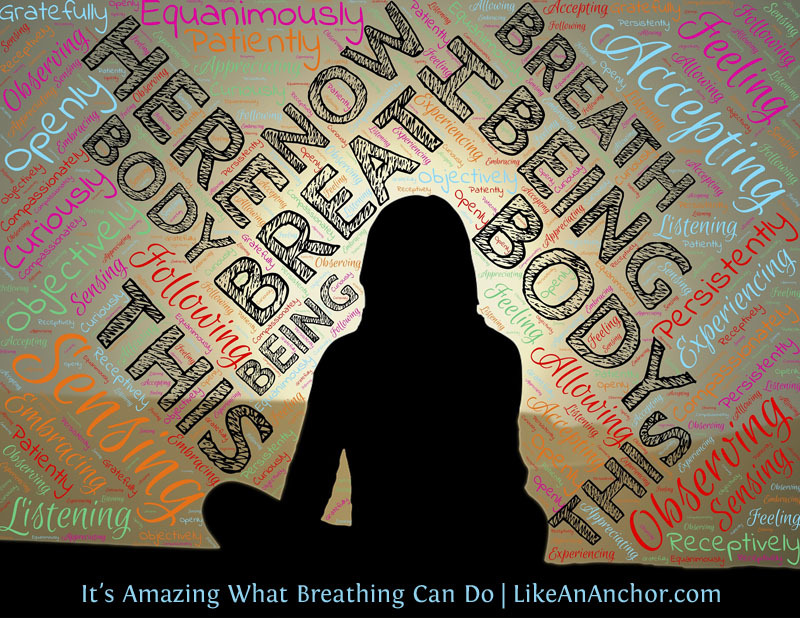 It’s amazing what a difference focusing on the present moment, grounding yourself in the physical world, and forcing yourself to breath deep can make. And I’m assuming this would help whether you’re dealing with every-day anxieties or with having more long-term anxiety. The techniques seem almost too simple, but they work and if you’re starting to feel panicky the last thing you need is to try and remember some complicated method of calming down. You don’t need to figure everything out, or get cured of anxiety, or conquer whatever mountain you’re climbing before you can start to feel better. Sometimes, all we need is to stop, breath, and tune-in to the present moment. To give ourselves permission to feel however it is we’re feeling rather than keep burying it or pressing on through. Hopefully, taking the time to ground yourself and just breath will help cultivate a sense of peace. But if not, don’t beat yourself up over it. Treat yourself with the same kindness I’m sure you’d show someone you love who’s struggling. Self-care isn’t selfish — it’s essential (another thing I’m learning that now seems like it should have been obvious). What fictional characters do you relate to as an ESFJ? Just as we can describe real people using the Myers-Briggs® typology system, we can also use the system to type well-written fictional characters. Some of fiction’s most iconic and intriguing characters are ESFJs, and today we’re going to talk about seven of them that I think real-life ESFJs will find relatable. Another great thing about looking at character personality types is that it helps us to better understand people who have different types than we do. Fictional ESFJs can serve as examples for what real-life ESFJs might be like, and also show how much variation can exist between individuals with the same type. Most people type Anna from Disney’s Frozen as an ESFP or ENFP, but hear me out. ESFJs lead with a function called Extroverted Feeling (Fe, or “Harmony”). Fe is a decision-making process that’s concerned with connection and meeting other peoples’ needs, and that’s what we see Anna prioritizing throughout the film. Like so many real-life ESFJs, Ann longs for harmonious connections with other people. She’s also so concerned with the needs of people around her that she asks Kristoff, “Are you going to be okay?” while she’s dying. If that’s not an FJ thing I don’t know what is. Are You A Good Person? and What Does That Even Mean? What does it mean to be “good”? Is it doing all the right things? Never messing up? Making sure you stay useful to God? Not exactly. Biblical goodness does involve moral uprightness, having a good character, and doing the right thing. But Jesus also tells us, “No one is good but one, that is, God” (Matt. 19:17, WEB). So when we’re instructed to do and be good, there’s also an acknowledgment that we don’t already have inherent goodness inside us. For us, becoming good is a process that happens as we become more like God. One of the fruits of the spirit listed in Galatians 5:22 is “goodness.” It’s the Greek word agathosune (G19), which Zodhiates’ dictionary says “is character energized, expressing itself in … benevolence; active good.” It is a more active character trait than kindness, though the two are similar. When we have God’s spirit inside us, it prompts us to do the same sorts of things that God does because He is good. Our God is good in every way. The Hebrew word tob H2896) means “good” in the broadest sense, including concepts like “better,” “beautiful,” and “pleasant.” There is no limit to the goodness of God, and “those who seek Yahweh shall not lack any good thing” (Ps. 34:10). Not only is the Lord good, but He gives goodness to those who seek Him and follow His example of goodness. What Do You Want Your Inner World To Look Like? The world inside our minds can be a fascinating place. For some of us, it’s even more “real” than the outer world. Introverts in particular approach the world from the perspective that reality is what we bring to it from within. However, every type has an introverted and an extroverted side. Extroverts have an inner life, just like Introverts have an extroverted persona they use in the outer world. We all prefer one or the other as our starting point for conceptualizing reality, but every human being has an “inner world” of some kind. Susan Storm’s post “The Secret World of Every Introverted Myers-Briggs® Personality Type” is what prompted today’s post. It got me thinking about how the worlds inside our own heads work, especially in connection with the Joyce Myers’ book Battlefield of the Mind that I’ve been reading. How much control do we have over the types of thoughts that we think? To what extent is our inner world shaped consciously? And if we don’t like something about the way our inner world or “thought life” is now, can we change it? The question of what our inner world looks like is probably most interesting to introverts, but I think it’s one that extroverts benefit from considering as well. None of us walk around all day with our minds a blank slate waiting for something outside us to fill out thoughts. We’re all using our inner thought life for something, even if it seems to just be running on automatic.